For the Brooks and Tonya Barta family, Christmas is about traditions, and it’s also about snowmen – lots and lots of snowmen. Tonya’s collection, which includes a variety of shapes, sizes and materials (cloth, wooden, ceramic, etc…), will be on display among the family’s other Christmas decorations during the “I’ll Be Home for Christmas” homes tour scheduled for 10 a.m. to 3 p.m. Saturday, Dec. 6. 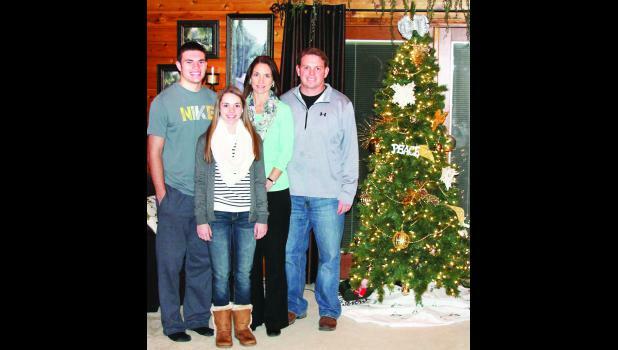 The Bartas, which also include son Mason, 16; and daughter Tabor, 13; have two large Christmas trees decorated in their home for the holidays. “We used to have a real tree every year, but we switched to pre-lit artificial trees a few years ago because it’s just easier for our busy schedule,” Tonya said. The Barta’s home on 214th Road, which they’ve owned for 15 years, has an indoor loft space area over their living room that they decorate throughout the seasons. Tabor’s room will feature a fiber optic tree, which fits in well with the room’s current color scheme of lime green, turquoise and pink, Tonya said. In the past, Tonya said the family would wait until after Mason’s birthday, which is Dec. 16, to decorate. Christmas decorating for the Bartas also revolves around the Holton High School football play-off schedule, as Brooks serves as the head coach for the team. State championship games are always held the weekend after Thanksgiving. Although it’s not decorated for Christmas, one of the rooms in the Barta’s home is filled with Brooks’ football memorabilia from Kansas State University and Holton High. “It’s a fun room, and people always end up in there because it’s fun to look at,” she said. Tonya said that she and Brooks like to focus their children’s attention on the giving aspect of Christmas and, as a family, they’ve packed shoeboxes for Operation Christmas Child and essential bags for the Jackson County Ministerial Alliance Christmas Bureau. Each year the family enjoys soup and chili at their home on Christmas Eve but otherwise is usually traveling to visit extended family. The family participated in a homes tour benefiting the American Cancer Society about 10 years ago and excited about this year’s tour. Sponsored by the Holton/Jackson County Chamber of Commerce and in part by the Jackson County Tourism Council, the “I’ll Be Home for Christmas” homes tour include homes owned by the Bartas, Les and Rosemary Wilkersons, Phillip and Ginger Lloyd, Dennis and Joni White and Brady and Brooke Black.